This is a beginner level program for boys & girls starting at age 3 years. Skaters strive to achieve the Skate Canada badge levels 1 to 6. This 45-minute program combines a 15-minute warm-up and two 15-minute group lessons with a professional coach and help from our P.A.’s (program assistants). The CanSkate coaches evaluate their skaters on a day-to-day basis, and upon completion of the session will provide a report card outlining their progress. • A parent /guardian MUST be present for the duration of all lessons. • Waterproof mittens, pants and jackets are recommended (no scarves). A program designed for skaters who are interested in pursuing Figure Skating. Group lessons are included focusing on various skating elements eg. Spins, Jumps, Dances, Edges and Turns. Badges are awarded as stages are completed. 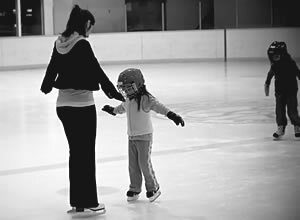 Skaters are often interested in private or semi-private lessons with a coach of choice. Private lessons will help skaters progress to the next level of skating. Lessons are usually 15 minutes long and occur during the skater\’s regular Canskate session. Parents are billed directly for these private lessons. If you are interested in private lessons please contact the coaches directly. STARSkate = Skills, Tests, Achievement, Recognition – STARSkate offers opportunities for skaters of all ages to develop fundamental figure skating skills in areas of ice dance, skating skills, free skate and interpretive skating.